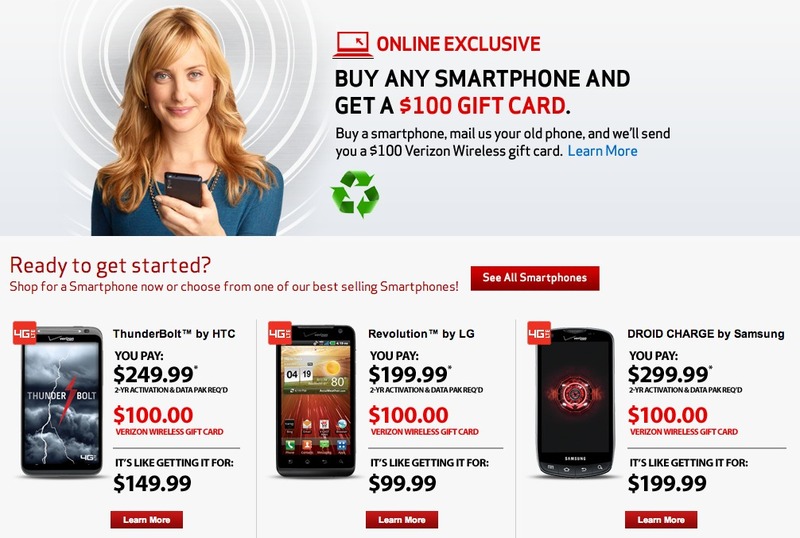 Verizon introduced a new trade-in program over the last week or so that will help you land $100 gift cards for trading in old phones and then purchasing new ones. The deal varies depending on your status (non-customer, adding a line, etc. ), but no matter what, should give you an extra $100 to put towards a new phone like say, the DROID Bionic. After reading some fine print, it looks like the deal could run through November 15 which would cover rumored device like the HTC Vigor and DROID Prime as well. Understand though, that if you were to buy something like say the Charge or Bionic, you will still have to pay $299 up front, but will then receive a giftcard afterwards in the mail to offset it by $100. Still, not a bad option. The site for this promo mentions that it is an online exclusive, but I’ve heard that this may also be available in stores. Looking for confirmation on that. In the store it works for customers upgrading from a basic phone (one not requiring data packages) to a smart phone (requires minimum $30). When you upgrade, you are sent a promo code for the VZW trade in site. Once entered, they send you a box to send in your basic phone, and then when they receive it they send you a $100 gift card. Currently the stores are only doing the upgrade promotion and not the new activations to VZW like they are doing online. Some customers are even eligible to upgrade early if they go to a smartphone. More on the $100 gift card promo.